Defence Secretary Michael Fallon and Work and Pensions Secretary Iain Duncan Smith have worked together on the policy change that recognises the unique demands and huge sacrifices that the Armed Forces community make to keep Britain safe. Under the plans, spouses, civil partners and their dependants aged up to 21 returning to the UK after accompanying Service personnel working abroad will be exempted from the rule which currently requires them to be resident for three months before being eligible to claim income-based JSA. The Habitual Residence Test ensures that people who have been living abroad for some time can show they have strong ties to this country before claiming benefits when they return to the UK. The change reflects the recognition that Armed Forces families are often required to go abroad and that changing locations can make it more challenging to find work. The decision is motivated by the principles of the Armed Forces Covenant, which is a promise from the nation ensuring that those who serve in their country are treated fairly. It is a pledge that together we acknowledge and understand that our serving personnel and their families should be treated with fairness and respect in the communities, economy and in the society they serve with their lives. Being posted abroad, often at short notice, is one of the many sacrifices our armed forces are prepared to make to keep us safe. When that happens it doesn’t just affect them, but their families too. So it is absolutely right that we do more to help to smooth any challenges they face when they return to the UK. We owe our Armed Forces a huge debt of gratitude for the service they have shown to this country, which is why we are committed to doing everything we can to help their families find work and make sure they get all the benefits they are entitled to. There are up to 10,000 spouses currently overseas, and up to 2,000 return to the UK each year. The change will also apply to children who accompany Service personnel abroad but return to the UK as young adults. Using evidence presented to us by a Naval Service family, we identified that spouses and older children within Armed Forces families were not eligible for state benefits, such as Jobseeker’s Allowance, when they initially returned to the UK after their posting, simply because they had not been residing in the country for the previous three months. This anomaly was highlighted to DWP and we are delighted that they have now reviewed and updated the policy to ensure that Armed Forces families are no longer disadvantaged. This will reassure families, who may be about to embark on an overseas posting, that they will not be penalised financially when they return to the UK. This is a great example of how the independent Families Federations can use the evidence provided to them by Armed Forces families to work with central government to influence policy reviews. 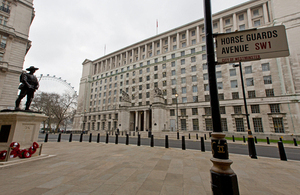 It also demonstrates how government departments, such as DWP, really are trying to fulfil their commitments to support members of the Armed Forces and their families, under the Armed Forces Covenant.